Perfect mix of recording features and inputs makes the Solo XT the best option if you need an all-around looper pedal. Digitech sits on the same pedestal with Boss, TC Electronic, and many other world leading pedal makers, which is just one of the reasons why we suggest that you try the JamMan Solo XT out. Another big reason is that this particular model is actually an improved version of the one that’s already proven to be a great looper pedal – the original Jam Man. In short, the Jam Man Solo XT provides a huge stereo looping time, a massive internal memory bank, a very hard casing, and that’s just the gist of it. Check out our full guide to see our other favorite looper pedals. Jam Man features a highly robust metal chassis, it has a special place for the micro storage card (which is sold separately) which will benefit you an additional sixteen hours of playtime, and a set of controls that are almost easy to use. That being said, this is not a beginner pedal per se, but the good thing about it is that the learning curve of getting the hang of it isn’t that harsh at all. There are several controls onboard the Jam Man Solo XT – the loop track select buttons, loop and rhythm level knobs, store, setup, and tempo buttons. It also has a brightly lit LCD display which shows which loop track you’re using at the moment, but what’s slightly confusing about it is the fact that there’s just one indicator onboard. However, instructions are written on the pedal itself, stating that the indicator will turn red when you’re recording, it will turn green when you’re playing the loop, and it will turn yellow when you’re overdubbing your loop track. 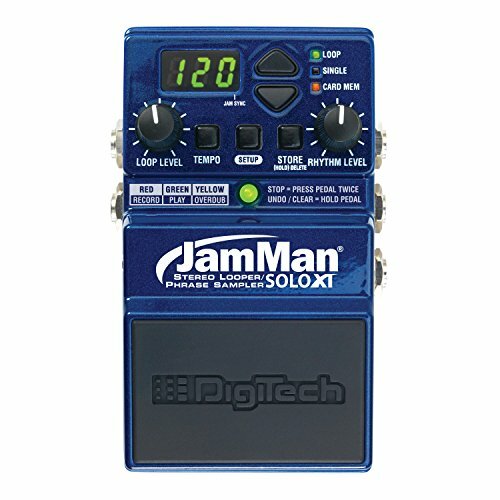 The Jam Man Solo XT is a wonderful, exceptionally versatile loop pedal, but it’s all but easy to use. Namely, in order to ‘stop’ the loop track you should press the pedal twice. This might be a bit harder to use onstage if you’re performing live as you have to be really quick about it. The bad thing is that you could easily make a mistake and hold the pedal down, in which case you’ll either undo your last selection or completely clear the loop track, leaving you with a relatively useless pedal. What makes the Jam Man Solo XT actually usable for live performances is the fact that, with a little practice, you won’t need to set it up at all. The level knobs can be adjusted prior to the gig, and pressing down on the pedal should come naturally after a while. In terms of audio quality, it’s absolutely amazing – the brand states that the audio quality of this pedal is on par with CD level audio. DigiTech’s Jam Man Solo XT is a wonderful pedal, but it will take a while before you get to properly get familiar with the many features it comes supplied with. Its only drawback is that it’s not so ‘user friendly’ in the traditional sense, but the plethora of benefits it provides are more than enough to compensate for it.